Our main goals are to communicate the fascination and relevance of Galactic astronomy to the general public, and to support scientists in representing the SFB at meetings and in public. In particular, we aim at bringing SFB science to a younger audience and informing young people about the associated career opportunities. Contents of the Milky Way Kit and students working on the magnetic Hertzsprung-Russell diagram. We developed the "Milky Way Kit", a collection of hands-on activities aimed at middle school and high school students. The kit features e.g. a magnetic do-it-yourself Hertzsprung-Russell diagram (printed canvas for use on magnetic blackboards), different scale models, activities related to stellar populations, an easy to use USB-spektrometer, as well as a interactive magnitude model. As part of our educational activities we offer workshops, mainly addressed at middle and high school students, available in German and English. They take place at the Haus der Astronomie in Heidelberg and can be attended by any class group. The workshops cover SFB related topics and focus on the stars of the Milky Way, giving an introduction into relevant stellar parameters, star formation and evolution and the Hertzsprung Russel diagram and its implications for astronomy. Additional workshops e.g. on the role of infrared observations for Milky Way astronomy are also available. More information can be found here. We also offer supervision of thesis works ("Wissenschaftliche Abschlussarbeit") by physics teacher students at Heidelberg University within the framework of the SFB. The thesis work includes both an scientific part and an educational part, where the produced scientific result is implemented into a school project. and 2015 on the chemical composition of stars in globular clusters (in cooperation with sub-project A8). All three were co-advised by SFB outreach scientist Cecilia Scorza and SFB members (S. Röser, N. Christlieb, and A. Koch, respectively). Interested physics teacher students (Lehramtsstudierende Physik an der Universität Heidelberg) are encouraged to contact us if you are interested in a thesis work within the SFB framework. Outreach to schools also includes direct visits by SFB (outreach) scientists to Milky Way Ambassador schools, as well as a very special event related to the Gaia mission: In collaboration with ESA, we organized the German part of a Europe-wide live event for schools, which included a direct link to ESA scientists and engineers working on the Gaia mission. Our local node of this event was attended by 300 pupils between the ages of 15 and 17, and included presentation by Cecilia Scorza and Stefan Jordan s well as by SFB scientist Coryn Bailer-Jones (touching upon sub-projects B5 and B9). The event is an example of a more general fruitful outreach collaboration between our SFB and the outreach team for Gaia-DPAC, the consortium tasked with analysing Gaia data. Workshop: "Die Sterne der Milchstraße"
Numerous public talks on SFB related topics were given throughout the last years. For instance, the 2017 edition of the popular pubic talk series "Astronomy on a Sunday before noon" was dedicated to SFB research, and consisted of five talks by SFB scientists (Hans-Walter Rix, Sabine Reffert, Rüdiger Pakmor, Andreas Just, Ralf Klessen) related to various subprojects. More information about the series can be found here. 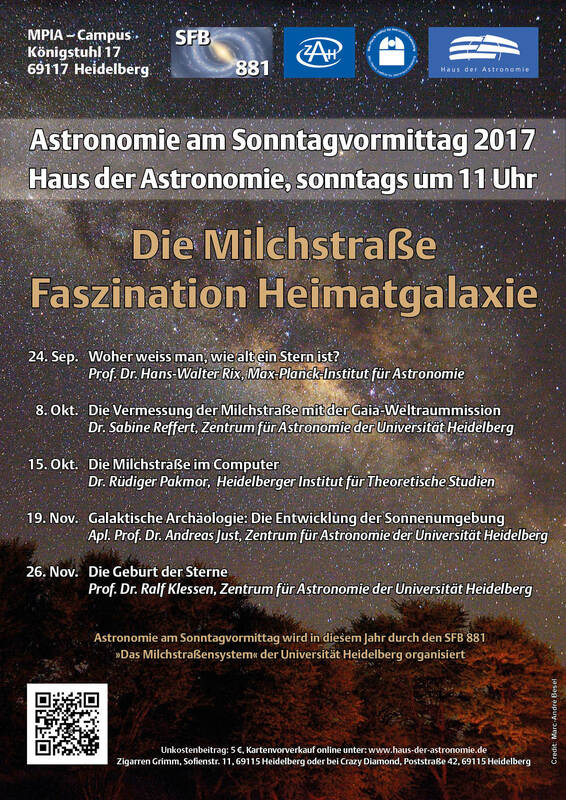 Additional talks by SFB scientists were given at the university anniversary talk series "Universum für alle" in 2012, and continuously at the popular "Fascination Astronomy" series at the Haus der Astronomie. An overview about the talks can be found below. 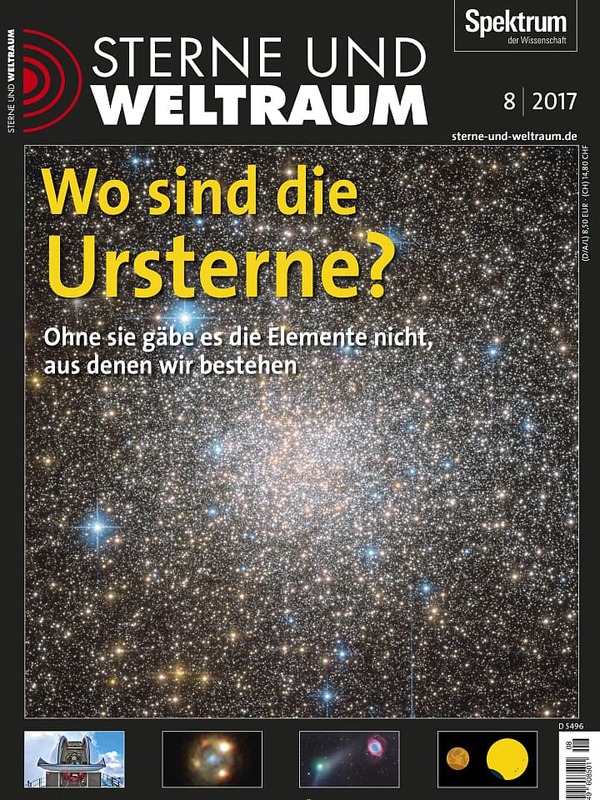 April 2017: Daniel Rahner (B2), Was macht ein Stern, wenn wir nicht hinschauen? Talks highlighting the space mission Gaia, the produced data and its importance for galactic astronomy and SFB science are given frequently by SFB outreach PI Apl.Prof. Dr. Stefan Jordan. A list of his talks can be found here. referencing the lead article written by N. Christlieb. 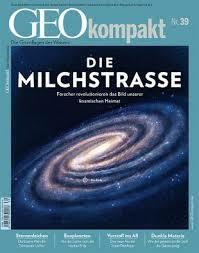 In June 2014 SFB PI Prof. Hans-Walter Rix prominently featured in a GEO KOMPAKT edition No. 39, talking about his galactic research. December 2013: Gaia Launch Event, hosted at Haus der Astronomie. March 2014: Gaia Live Event, an event aimed at high school students around Heidelberg hosted at the Astronomische Lehrzentrum at Helmholtz Gymnasium in Heidelberg. SFB outreach scientists talked about the Gaia space mission, including a live broadcast to ESA headquarters. September 2016: Gaia DR1 Event, press event on the occasion of the first data release of the Gaia space mission. June 2016: Participation at the Open Day at Max Planck Institute for Astronomy and Haus der Astronomie. April 2018: Press event on the occasion of the second Gaia data release, covering up to 1.7 billion stars. Additional exhibition elements include a back-lit SFB Milky Way model as part of the permanent exhibition at the European Southern Observatory's new visitor's center and planetarium located in Garching close to Munich, the ESO Supernova. In June 2018 SFB content was included in yet another traveling exhibition, the Explore Science 2018 in Mannheim, funded by the Klaus Tschira Foundation. 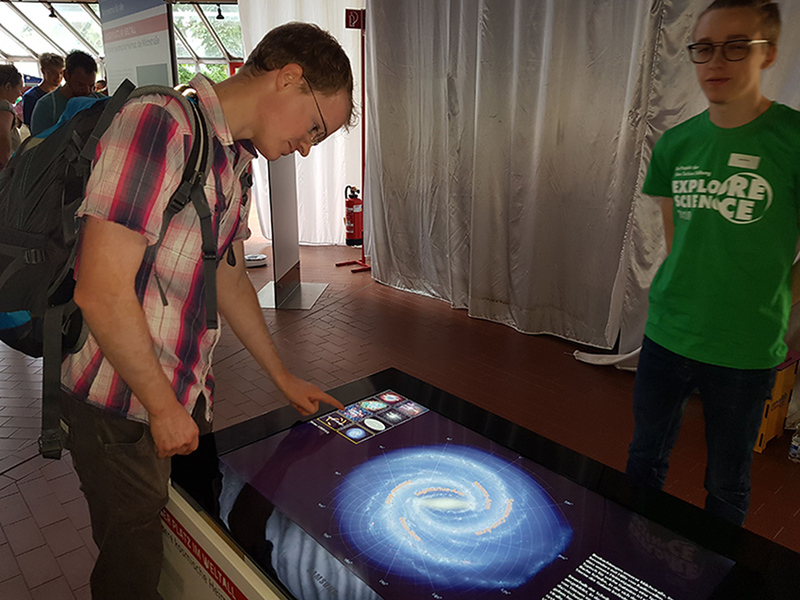 An interactive Touch Table enabling visitors to explore our home Galaxy with the touch of their fingertips was installed at the exhibition, that attracted 52,000 visitors this year. The exhibition, designed at the Max Planck Institute for Astronomy and the Haus der Astronomie, both part of the SFB, will become a traveling exhibition after the second Explore Science event in Bremen, later this year. Hands-on experiments based on the Milky Way Kit were already featured at two large-scale Explore Science family science fair events organized by the Klaus Tschira Foundation in Luisenpark in Mannheim: In 2012, we presented the astronomical distance measurements central to our knowledge of our cosmic neighbourhood at the mathematics-themed edition of Explore Science, which was attended by more than 56,000 visitors. In 2014, we returned to Explore Science with an exhibit about the Milky Way as an environment for habitable planets, and the variety of planets within our home Galaxy, suitable to that year's theme of biological and environmental diversity, attracting more than 43,000 visitors. We also used our exhibits to present the SFB at the national conference of the German astronomical society (AG) in Tübingen in September 2013. The following English and German short films were produced by Dr. Maria Bergemann, the Max-Planck Institute for Astronomy, the SFB 881, the Haus der Astronomie, and the Institute of Astronomy, Cambridge. How to find an Exoplanet — Wie findet man Exoplaneten? Our Galaxy – Milky Way. A big UFO-like Object — Unsere Heimatgalaxie - die Milchstraße. Ein großes UFO-ähnliches Objekt. Gaia - Teamwork for a billion stars, a 50min production explaining about the Gaia space mission and its implications for astronomy. Stellar Parallaxes, an explanation video for Gaia Parallaxes by Stefan Jordan. On April 8-10, 2015, 22 members of the Gaia Data Processing and Analysis Consortium DPAC met in Heidelberg to discuss the current status of AGIS, the Astrometric Global Iterative Solution, the mathematical procedure that will determine the positions, movements, and distances of about one billion stars from the individual measurements of the Gaia satellite. Klaus Jäger and Stefan Jordan have produced a 15 minute DPAC outreach video that explains the Gaia mission and its goals. The movie contains interviews with leading Gaia scientists, who explain the challenges behind AGIS and describe how it will finally result in the most accurate star catalogue ever. With the data retrieved from the Gaia second data release a number of videos were produced using Gaia Sky Software. A playlist of thes DR2 videos by Stefan Jordan can be found here.